Next week they're debuting "Bring a jacket; you'll catch your death in this chill." Fall, of course, is known for its colorful foliage. ...feather? Spear?Long-necked snail? Worm in a hat? Worm in a skirt? Garden trowel? Underside of a snorkeler's leg? Hey, I could go on all day. I suspect, however, that Zoey K., Hap C., & Brady want me to make like a tree, and get out of here. The last picture looks like a geoduck. What makes me the saddest is that I already used that line earlier this morning as a joke. My geekiness has been confirmed. I'm not a noide, I'm a geek! Ok, I admit it! I'm a geek. Michael J. Fox was hot then and is hot now. "Back to the Future" ref is FTW! Cherries? My guess is that they're supposed to be apples. But who has apples and pumpkins the same size? And how much pseudophedrine do you have to give an apple and pumpkin to look that happy? The dancing cherries and pumpkins on the first cake are kinda cute but…where in the world do the cherries get as big as pumpkins?!? The last one? That’s a turtle. Walking away from us. With, um…tummy trouble. WV: spedsol. "*Sniffles! * I spedsol much dime on dis site, I'b dow behimb in by work. *Sneeze! *"
I love how you left the most obvious guess off that last cake....Geoduck! I can't wait to log in every morning to see the days wrecktastic wrecks. You have to admit that the first cake was beautiful printed-AND spelled correctly! ...I'm having trouble (and am troubled) by the last cake..can we say octopus tentacles, anyone? Man, I love those movies! I still want a Delorian with a flux capacitor. I think there is a fungus among us. LMAO...I totally thought of Biff. That song is hilarious- I didn't know he was doing comedy. 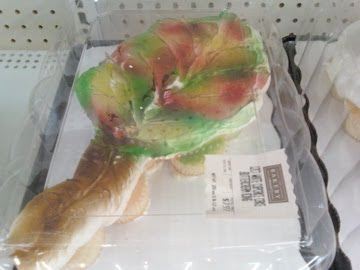 I have never been afraid of leaves, but after seeing these "cakes," I might be. I think the tree claws have ears... Creepy. WV: learic: Those trees in the first cake make me learic of walking in the woods! make like a baby and head out? OK, so the wrecks were funny today but that video of Biff made me laugh so hard I almost cried!! The first cake with the trees isn't so bad...except for that awkward text. Couldn't they just say "Happy Fall!" or something? Why yes, I did immediately think of Biff. Scary. I thought the last one looked like a snail that got stepped on and then went moldy. It took me a minute to realize that the pink thing on the right-side tree was supposed to be a knot-hole. I thought the decorator had dropped their gum. Definitely a long neck snail is the perfect description for # 3. Now I've got to find your book"
Well, up here in the massive corn field affectionately known as "Indiana," these bakers are a step or two behind. Fall is already picking up her purse and waving hello to winter as he clocks in, baby. The third cake is clearly the elusive poo-necked turtle. I am in South Florida, hating that we dont have fall! :( But loving these ridic. cakes.. haha. Thanks for the AWESOME blog, read it every day! Also melting in Florida, but add pouring Gulf Rain to the temps. Forget cake today ! I need AIR to breathe! Welcome back from the land of the ill! Woohoo, another geek point! Three more and I’ll finally reach 12th level. That’s the one where I get the Esoteria Bibliocrypha feat, which allows me to name geek references by their episode, scene, or issue number. I'm pretty sure those are apples. Cherries are a summer fruit. That last one is just plain UGLY! Cake #1, I see even Freddy Kruger takes a vacation. Cake #3, interesting species of sea slug you got there, although it looks like someone ran over one end. The first one isn't that bad other than the claws (and the cherries being the same size and pumpkins..I mean, even if they are supposed to be apples...). The second shows that one cannot even make a successful lumpy maple leaf with a cupcake cake. As to the third cake, I think you have said it all. Oh heck, I am utterly terrified of worms and slugs, and I cannot look at that last cake - it's freaking me out! Maybe someone should have added red icing dripping from the menacing tree hands (?) and a red "not" in between "will" and "be"-ya know, to go along with the whole Halloween season...and maybe to explain why there were tomatoes (wtf?) on the cake. That definitely would have been an improvement and bonus hilarity. That last one is just so sad. So wrong, so..wrecky. "Underside of a snorkeler's leg" is a good interpretation for the last one. I think another entry in the manual on how not to wreck cakes, though, would have to be "Always be very careful about making cylindrical objects with flesh-colored icing." the tree hands are kinda scary, you sure it wasn't for Halloween? The last one is a fancy tree spatula...for scooping up nuts. "Biff" was on Psych last week. Squigdly: That was totally my first thought! The claw trees of death can hear your every step! I agree, the tree claws look more like the kind of trees that reach out and grab unsuspecting trick-or-treaters. The pumpkins are kind of cute--maybe they're made to give a false sense of security? "Come iiiiin children...."
The leaf almost makes it. ALMOST. Get rid of the green blob and we might be in business. Like the varied hues of fall foliage, fail comes in all sorts of degrees. Wreck on! Drat, several people beat me to the geoduck comparison. At least that supports my assertion that that's what the last cake looks like. ROFLAWM - That Maple Leaf CCC looks like a mutant carrot. You should totally make a mole day post with chemistry/mole cakes! OMG as if I didn't already love CakeWrecks enough, you go and post a BTTF reference! You're my hero!!! it's amazing how much icing they can pile on top of cupcakes. I totally nailed that Biff quote! and what a reward! lol! The last one looks like Adam's fig leaf isn't quite doing the trick. I agree. The last cake looks like a geoduck clam. Agree with E. Thta totally looks like a geoduck. I may be geeking myself out further than the obvious Back to the Future reference, but if anyone rememebers Babylon 5, the last cake looks like Londo's extra "appendage." C'mon, you know, the one he uses to cheat at poker and while he's, er, with the ladies! How do you think I feel out here in the desert in az?? I'm still wearing spaghetti straps and we broke a record last week for the highest temp in October of 104!!! I miss fall :( anyone else see a creepy eye on the left side of the last cake? People have already beaten me to "geoduck" on the last picture, so I'm going to have to go with tube worm. Highly diseased tube worm. Yay for anonymous, it's not just me that thinks that last one has a certain .. maleness quality to it. Uh, call me crazy (thank you), but that first one is not a cake! It's just cardboard with frosting on it. What a complete and utter waste of frosting!! That is the ultimate wreck! I think the creepy poo claws on the first cake are reaching up because they "want sprinkles." LOL! You'll never believe it but my husband and I were just talking about Biff this morning! Thanks for a great laugh! Too funny and no our fall in Florida is lacking in color for sure! Last one is definitely a geoduck! Thanks for today's Biff reference!! I think the Fall Will Be Here Soon could be a less ominous version of - Winter is Coming - from the Song of Fire and Ice series. 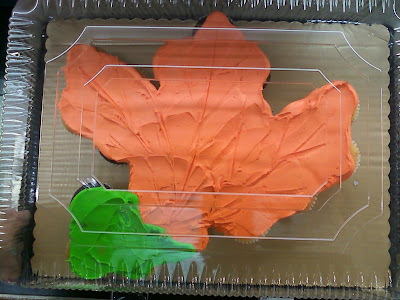 The second cake looks more like a really awkward bunch of carrots than a leaf. Are carrots considered a fall vegetable? In all those suggestions of what that last cake could be, I can't believe that the term "poo" wasn't used, 'cause oh ma gawd. Forget the hilarity that is the entire post. Skip to the parting shot. "Make like a tree...and get outta here"
and can I just say, that I have used that line since the movie came out in the 80's, and still my husband looks at me like I'm rediculous. As in, he still doesn't get it. He just thinks I'm screwing up an already bad joke. OH! My sides...Biff Tannen...I heart you big time! Cake geeks unite! Love the Biff reference (and totally missed him on last weeks Psych). Fall has arrived here in Seattle so to me that first cake is a cheerfully haunting reminder to clean out the gutters. So on the 3rd cake, I immediately thought "Adam is dangling beyond his fig leaf's protection." Hey, my mind's always in the gutter, sorry. Then I noticed the eye and thought "God is watching...and judging...always judging." wow. A three pronged carrot huh? How very, Autumn. I had no idea what a geoduck was until I realized it was pronounced gooey-duck. OoOOooh. Mike Rowe has taught me well. Oh cable how I miss thee. LOVE...LOVE...LOVE your blog, did I say LOVE? Yup, I meant LOVE !!! I have told everyone I know about Cake Wrecks. I come in here and laugh my fanny off if i've had a challanging day. 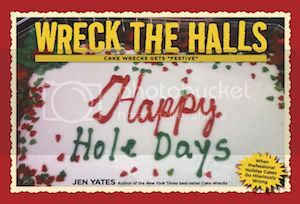 So I just dropped in to say - Cake Wrecks ROCKS!! (I thought I'd better say it, as I wondered if my message was hard to understand - you know, because I was so subtle in expressing my LOVE for your blog!!) Have a great day and thanks for making all of us laugh so hard! Ha ha, I immediately thought of Biff too. "It's LEAVE, you idiot... make like a tree and LEAVE." I still love that movie, even after seeing probably 250 times on TBS in the past...oh, man...wait... has it seriously been 20 years? About that first cake: I realize that "the walls have ears" but the forest? not to mention the creepiness factor -- very Wicked Witch of the West. All it needs is some flying monkeys in little bellhop costumes. As much as the last one does look like a geoduck, my 3 year old came to see what I was laughing at and asked "what is that thing that looks like a dirty snake?" Last one: what my cat leaves on the carpet after eating grass. Imobte HERE in bad jokes, so I'll make like a tree and split. I can't believe I just found this site! I laugh out loud quite a lot when I read your stuff. Pure genius! I think I'll have to carry my camera wherever I go, just in case! Thanks for bringing such levity to my otherwise hum-drum day. Looks just like a multicolored geoduck. Here's a pic for anyone not from WA state. I suspect you meant: "...make like a tree and LEAF!" And if anyone wonders why I laugh out loud when I read Cake Wrecks, I can just say "...feather? Spear? Long-necked snail? Worm in a hat? Worm in a skirt? Garden trowel? Underside of a snorkeler's leg?" and show them that photo. You rock as always, Jen. Hey, my WV is whingy--I get all whingy when my cake doesn't look like the photo I showed the baker. Oh my gosh, as soon as I read that I instantly thought: Biff. I went through long-necked snail and also long-necked turtle, but I finally settled on Plesiosaur. Or the Loch Ness Monster. Which may or may not be the same thing. 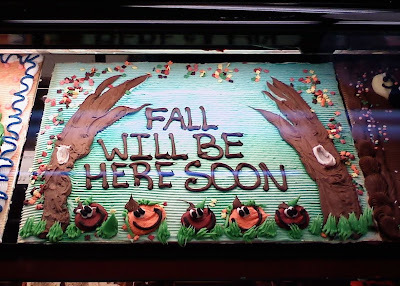 aww, I thought the "fall will be here soon" cake was cute! Since when is a knot hole pink? The fall cake actually looks pretty good, its just that the message is a little silly. And YAY, Back to the Future references ftw :D that trilogy is my favourite of all time! I've been lurking this blog for years and I had no idea you were here in wrecktastic Florida - where it's bikini season from February till November. No wonder you post so many unappetizing deserts! I did myself serious nasal-cranial damage snorting with laughter at the garden trowel/scuba leg. Good stuff. I think the first cake is cute. I'm looking forward to the Halloween wrecks. Btw Thanks for this blog. I found it a couple of weeks ago via a link in an author's website. Have been having a good laugh since! More like FAIL will be here soon... oh wait, its already here! Seriously, that's a geoduck if I've ever seen one! That looks like a slug coming out from under a diseased leaf!!! Disgusting!!! The video of "Biff" made my day!!! sorry, but that last cake looks like something that fell on syphilis and gangren..if you know where i'm going with this. "Make like a tree and get out of here!" YES!! I love your pop culture references! That's about as funny as a screen door on a battleship... I loved the video, btw! Your blog rocks, and has confirmed many times over what I've known my whole life: I am truly a geek!